How much is a car really worth? When a Detroit news reporter once asked the great American icon and automotive pioneer, Henry Ford, how he determined the selling price of a Ford automobile, he replied, “an automobile is only worth what someone is willing to pay for it.” While frantically jotting down the quote, the reporter started scratching his head, then he looked back at Mr. Ford and asked, “well, how do you know what someone will pay?” Mr. Ford just grinned as he pointed to the next reporter thus leaving the mystery unsolved. Here we are today, over 100 years later, our society transformed by information and technology, and the only thing we’ve learned about determining what a car is really worth, is that Mr. Ford was right! So, if part of your job includes finding a home for you company’s old vehicles, then you simply have to find the right “someone” who is willing to buy your used vehicles for the highest possible market price. Sounds easy enough, but if you’ve spent any time at all trying to sell used vehicles on your own, or trading them in to a dealer, then you already know the process is typically a time-consuming hassle. But, the good news is that it doesn’t have to be this way! A professional Fleet Manager knows exactly how to eliminate all of the “unknowns” in selling used cars from your fleet through a process called – Remarketing. Fleet Managers are experts in the used vehicle marketplace with access to vast sources of information and large pools of buyers through national auction networks. These resources allow Fleet Managers to maximize the resale value of your older vehicles and to turn the old inventory quickly preventing frozen capital. Here’s an example of how Fleet Services saved thousands of dollars on just one vehicle for a client: ,The client needed to replace a 1999 14-passenger shuttle van with 51,000 miles so the Fleet Manager called the dealer who originally sold the van, and their bid was for $3,000. 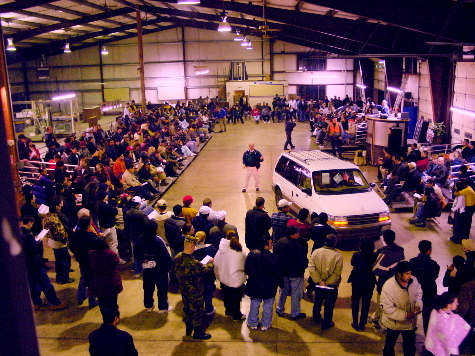 The Fleet Manager had experience with an auction that specializes in these type of vans, so the van was sent to auction where it was seen by dozens of buyers and bid on by several, which resulted in a sale for $6,250. After the auction fees, this was a $3,000 gain on one vehicle! This bus just happened to be a specialty vehicle while most of what we remarket are normal everyday passenger cars and work trucks and vans. We remarket any type of vehicle, and our Fleet Managers know exactly where your vehicles will sell for the most money, in the least amount of time, with minimal hassle . . . mystery solved!! Henry Ford knew his product, he knew his customers, and he didn’t use the S.W.A.G. method to determine how to price his vehicles. Your company shouldn’t either. For more information on how Fleet Services can help you with Remarketing your company vehicles, click-on the link below.